July 4th, 2016 - Reno, NV - NuLegacy Gold Corporation has arranged a non-brokered private placement financing of 10 million units at a price of C$0.30 per unit for gross proceeds of C$3.0 million. Each Unit consists of one common share and one share purchase warrant, with each warrant entitling the holder to purchase one additional common share for a period, subject to acceleration, of eighteen months at an exercise price of C$0.45 per share. "We are delighted that improved markets and NuLegacy's progress are permitting us to further fund our exploration programs at better than twice the price of our April funding with OceanaGold," commented Albert Matter, NuLegacy's Chairman. "This funding will strengthen your company's balance sheet and enable us to accelerate the exploration of the Iceberg gold deposit and the rest of our highly prospective 38 sq. 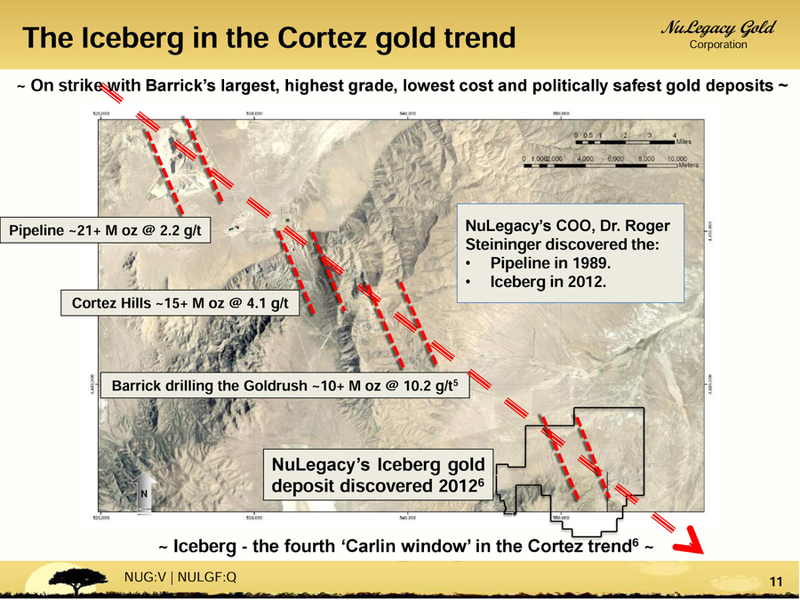 mile land package in the famed Cortez gold trend of Nevada." The financing is expected to close on or about July 13, 2016, prior to which Barrick Gold Corporation, OceanaGold Corporation and/or Waterton Precious Metals Fund II Cayman, LP have the right to elect to participate to maintain their current equity ownership interests in NuLegacy Gold (as announced February 23, 2016, April 13, 2016 and August 18, 2014 respectively). Closing is subject to conditional acceptance of the TSX Venture Exchange and finder's fees may be paid in accordance with Exchange policies. Inquires as to participation should be directed to our Chairman, Albert Matter (albert@nuggold.com / 604-639-3640) or the Medalist Group of Toronto (Steven Sandusky at ssandusky@medalistcapital.ca / 416-307-1035). Drilling of the 10 holes of the first phase of the 2016 exploration program (four phases totaling 40+/- holes) is completed, and the assays are expected to be ready for release in the second half of July. i These figures are conceptual in nature and derived from a compilation of 149 historic and 34 NuLegacy drill holes in and around the Iceberg deposit. To date, there has been insufficient exploration to define a mineral resource and it is uncertain if further exploration will result in the target being delineated as a mineral resource. ii The similarity and close proximity of these deposits to the Iceberg is not necessarily indicative of the gold mineralization in the Iceberg deposit. For further information, please phone 604-639-3640 or contact James Anderson (CEO) at james@nuggold.com, Albert Matter (Chair) at albert@nuggold.com, Roger Steininger (COO) at roger@nuggold.com, or Frank Lagiglia (ICM) at frank@nuggold.com ; or visit www.nulegacygold.com. This news release contains forward-looking statements, which relate to future events or future performance and reflect management's current expectations and assumptions. Such forward-looking statements reflect management's current beliefs and are based on assumptions made by and information currently available to the Company. Readers are cautioned that these forward looking statements are neither promises nor guarantees, and are subject to risks and uncertainties that may cause future results to differ materially from those expected. There are no known resources or reserves in the Iceberg deposit and the proposed exploration programs are exploratory searches for commercial bodies of ore. In addition, the presence of gold deposits on properties adjacent or in close proximity to the Iceberg Deposit is not necessarily indicative of the gold mineralization on the Iceberg Deposit. All of the forward-looking statements made in this news release are qualified by these cautionary statements and those in our continuous disclosure filings available on SEDAR at www.sedar.com including our annual management's discussion and analysis dated July 28, 2015 for the year ended March 31, 2015. These forward-looking statements are made as of the date hereof and the Company does not assume any obligation to update or revise them to reflect new events or circumstances save as required under applicable securities legislation.